Clean and dry the chicken. Coat the inside of chicken with half a tsp of five spice powder. Combine the marinade ingredients except for the honey and pour in to a zip lock bag along with the chicken. Ensure that the marinade evenly coats the chicken before letting it marinade for at least 4 hrs. Once the marinading period is over, remove the chicken from the bag; discarding the slices of ginger, but retaining the marinade. Heat an oven to 170°C. Once it has heated up, set up a baking tray with a grilling rack and place the chicken on top of it. 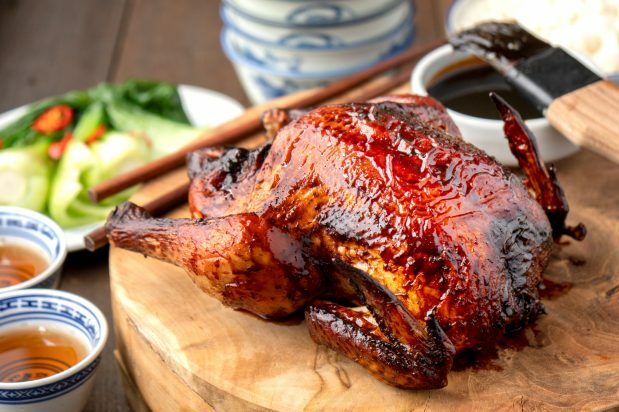 Every 20 mins, baste the chicken with oil to stop the skin from drying out. While the chicken continues to cook, pour the leftover marinade into the pan and add the honey. Over a low heat, cook the sauce until it has fully heated through. After the chicken has been in the oven for 1 hr, swap from basting with oil to basting with the marinade. Continue to marinade the chicken every 10-15 mins for 1 hr or until chicken is cooked. Once the chicken has been cooked through, remove it from the oven and allow to rest for 15 mins before serving with rice and vegetables.